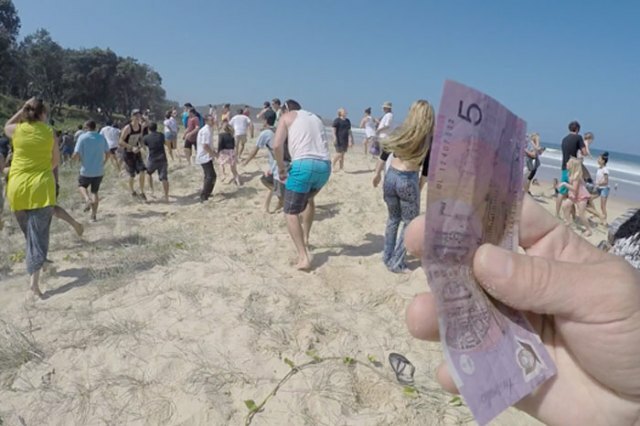 Point Break Cash Drop sees $5,000 raining from the sky! 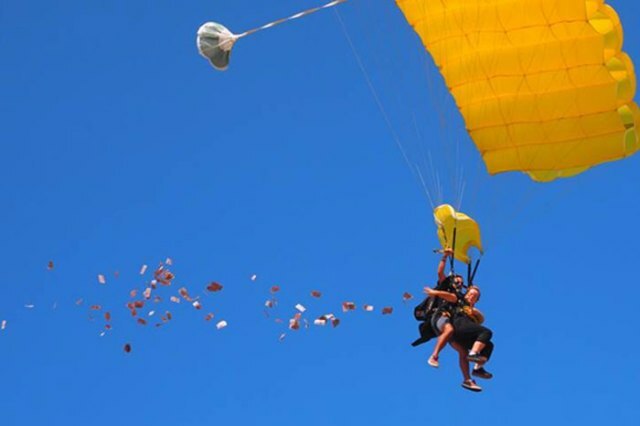 This article on the Point Break Cash Drop was written by Gerri Whittaker and originally published in Australia Skydiver Magazine (ASM). 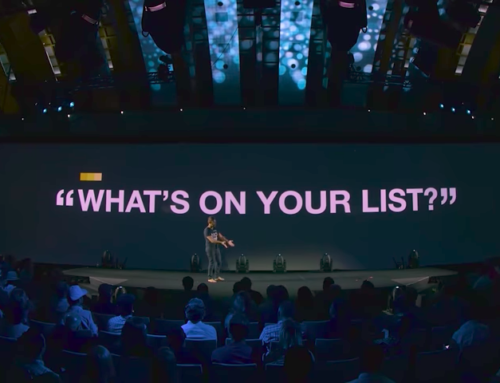 The APF coined it Ambush marketing, and well, it certainly caught people by surprise – who would have thought $5,000 would rain down from the sky? But that’s exactly what happened on the 24th of January 2016. 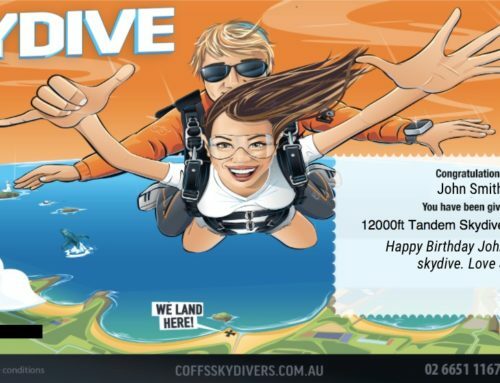 In conjunction with the Point Break movie launch and the APF’s new marketing campaign, Coffs Skydivers created a promo to launch our new website, our corporate rebrand, and changing our name from Coffs City Skydivers to Coffs Skydivers – The Point Break Cash Drop. This would set our little city on fire and would reach people from all over the country. Firstly we decided to make a trailer, a piss take on the Point Break trailer (you can view it above or on youtube by searching ‘Point Break Cash Drop’). The APF, our major sponsor, sent Christian Whyte to us to film and produce the trailer. This was the funniest two days I can remember. Being creative, filming, directing and laughing our butts off. We decided we needed a couple of girls in the trailer, so we jumped in the van, went to the backpackers and grabbed two German backpackers, told them we were making a little movie, and asked would they come to be a part of it? They ended up moving in two days later and have stayed for a month! Once we had done this we went to local businesses and asked them for their support and backing to raise the $5,000. 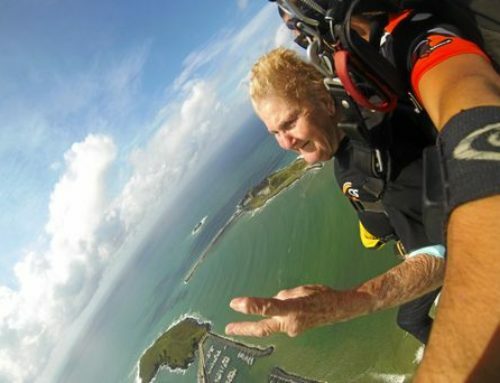 Along with $1,500 from the APF and $1,500 from Coffs Skydivers, we raised another $2,000 and a major prize valued at $1,750 which was an accommodation and attractions package in Coffs Harbour. With a bunch of really clever digital marketing, mainly through our Facebook Page, we were able to create an interactive, fun competition, which ended up with a reach of 150,000 people from all over the country, just through our own platform, not to mention all our key stakeholders digital platforms, as well as a number of national radio slots, a free $4,000 TV ad campaign donated by NBN Television, print media and more. Not bad for a little dropzone in Coffs Harbour. 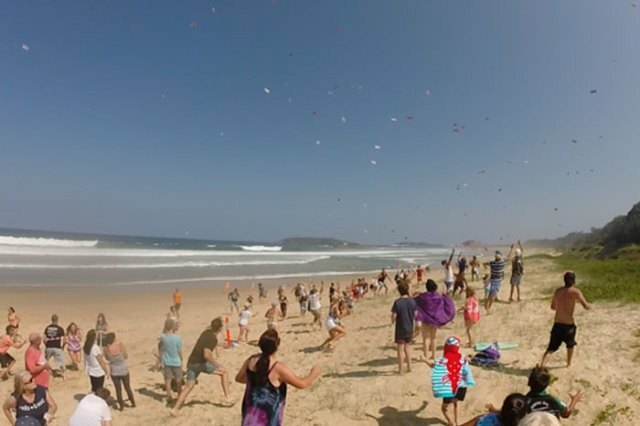 The day came, the weather prediction was poor but in true Coffs fashion the Sunday turned on a truly spectacular day with 10-15 knots blowing from the SE; perfect for throwing money onto a beach! 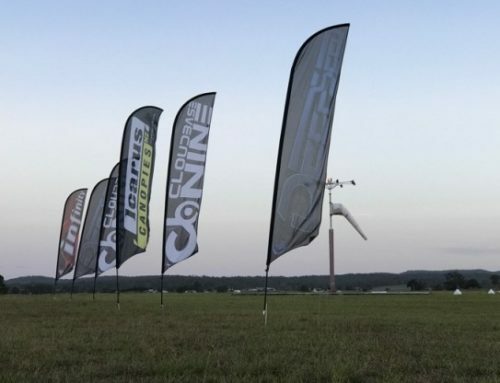 We did two tandems with licensed skydivers and released $5,000 in $5 notes down to the 77 people who had successfully made it into the Cash Drop Arena. Nethertheless, the wind had other ideas and blew the second drop of cash all over the place, into the Arena, into the trees and all through the spectators. So many people we giggling and scampering for their share in the 1,000 $5 notes flittering above them. One little fella, 14 years old, managed to scamper about and collect $125; he was stoked. From here it was into the Hoey Moey local pub for a well earned beverage and the Point Break Cash Drop after party, at which the major prize was drawn. The promo was a great success, bringing the community together for some good clean fun, spreading the word about the skydiving lifestyle (fun!) and promoting skydiving to people all over the country. A big huge thanks to our awesome sponsors who could see the vision, including the Australian Parachute Federation, Hoey Moey, NBN Television, The Legendary Pacific Coast, Opal Cove Resort, Dophin Marine Magic, A1 Coffs Coast Tours, and of course, the legends at Coffs Skydivers. 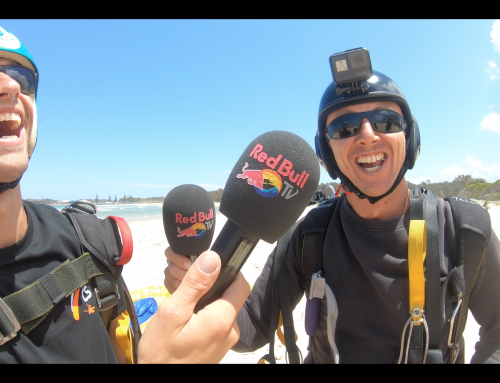 We believe promoting the skydiving lifestyle and skydiving community is fun and a powerful marketing tool. Let’s promote who we are and how live. That’s what excites people, the idea of living a life less ordinary. Harley Davidson promotes the riding lifestyle, freedom, wind in your face, not mainstream, instead of selling motorbikes. Very successful marketing. Let’s promote a group of professional sportspeople who get paid to have fun. Let’s promote outrageous characters whose antics leave other people amazed. Skydivers who have decided to unplug from the matrix and follow their dreams. Their idea of a good time is to fall out of a plane with their friends. Let’s promote a community whose friendships are forged by trusting each other with their lives on a regular basis. The intensity and connection felt within the skydiving community is incredible. To be connected to positive thinking, open-minded, excited people who I can share my life with, is something that people would love to feel and be a part of. Let’s create amazing, quirky, exciting promotions and events that reflect who we are and how we live.